The U.S. Department of Agriculture has allotted over $5 million in grants for "Farm to School" projects, including nearly $100,000 for grade school children in Montana to raise animals that will later appear on their lunch trays. "In rural and urban communities across the country, Farm to School programs teach students where food comes from, while providing healthy foods that are grown locally on farms and ranches across the nation," said Agriculture Secretary Tom Vilsack when announcing the grants last week. First Lady Michelle Obama’s Healthy Hunger-Free Kids Act of 2010, which set up new federal school lunch standards to fight childhood obesity, authorized the spending. Farm to School uses taxpayer money to pay for schools to build gardens and serve more locally grown foods. The government will spend $5,116,918 for 71 projects across the nation, including Livingston School Districts 4 and 1 in Montana. Livingston will receive $97,001 for its Farm to School program, which includes "an animal husbandry project that will involve students raising animals that will be processed and used in the school cafeterias." A $95,500 grant will pay for schools in Philadelphia to freeze blueberries and collard greens that will be served in the winter, and a group in Grass Valley, Calif., will create an "educational farm" with a $96,000 grant. Lyon County School District in Dayton, Nev., will use $100,000 to try to increase the "number of food-literate children through school garden exposure." Every Thursday will become "California Thursdays" in Oakland, by using $100,000 to serve state-grown foods. Eight school districts in Topeka, Kan. will serve two local food items each month with $100,000. 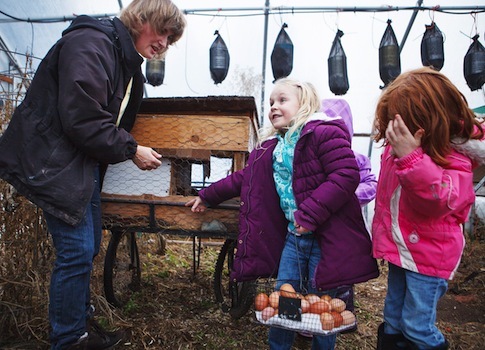 A school district in Boulder, Colo., has been given $96,477 for an "intensive marketing and education program" to promote farm to school with field trips, farmer visits, student chef competitions, and posters. "[W]e must increase the total number of children eating the school lunch menu regularly, and improve student acceptance and consumption of locally sourced foods as part of these meals," the school district said. The School Board of Alachua County in Gainesville, Fla., will use a $45,000 grant to hire a "Farm to School coordinator." Some project goals seek to change kids’ behavior. Five public charter schools in New Orleans will receive $100,000 to increase "knowledge, changed attitudes and behavior among students and parents, resulting in increased consumption of locally-sourced fresh foods." Laurel School District in Delaware will use a $38,126 planning grant to apply the "principles of behavioral economics to all four school cafeterias to encourage students to make healthier choices." "Our cafeterias are composting. We're making soup from locally grown pumpkins, talking to farmers about bringing local beef into the district, and offering ‘Try It’ days to give students a chance to discover new foods," said the Portsmouth School Department in New Hampshire, which is expanding its farm to school program through a $30,737 grant. "Our challenge now is to build on this excitement, spread the good ideas across the district, and make the work sustainable over time," they said. "The funding for this grant will allow us to do the planning we need to make this dream a reality." This entry was posted in Issues and tagged Government Waste, Tom Vilsack, USDA. Bookmark the permalink.